We have visited three distinct parts of French Polynesia. The Marquesas were awesome, and it is hard to imagine any other place measuring up. By the way, did I mention that the Marquesas left their mark on me…? 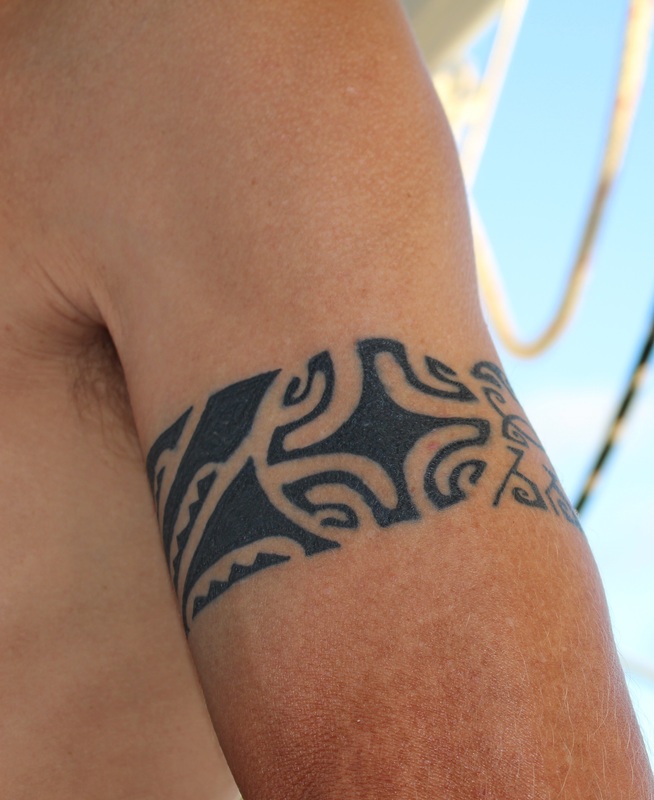 The squiggly cross is a symbol of the Marquesas. The dark/shark teeth area is about strength and courage in the physical world and beyond. On the back are three rows of symbols that you can’t much see. One is a symbol of waves/voyaging, one of sea turtles, which are a symbol of protection (at sea, by juxtaposition), and the third row is a symbol of men, which could refer to family, to my sailing partners, to having ‘brothers’ in my life, or more specifically I think of them as a symbol of my men’s team. Part 2 of French Polynesia was the Tuamotus — the atolls. Very cool in a very different way from the macho Marquesas. And then Part 3 has been the Society Islands, starting with Tahiti. It has taken a while for the Society Islands to grow on me, but they have. I think particularly with the drumming, joining in the dancing (another good video you can’t see now! 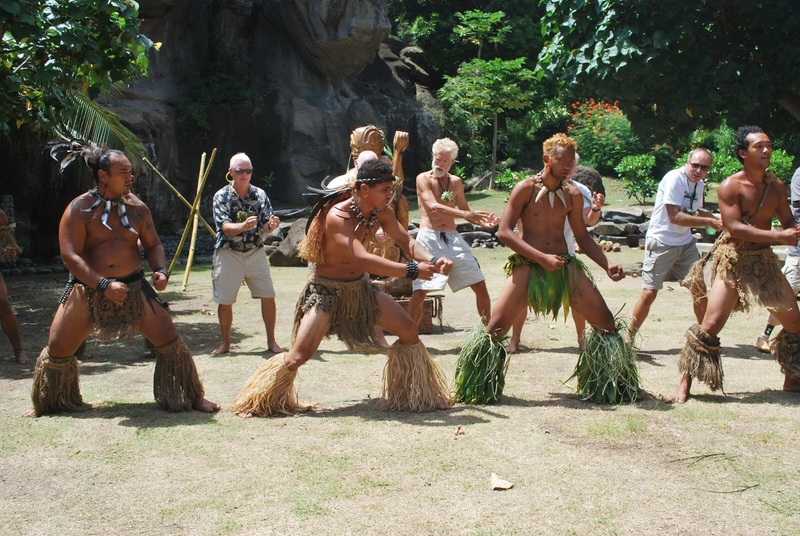 ), and the wonderful friendliness of the Polynesian people. And having a fringe reef around the rugged islands is the best of both worlds (impressive sights plus calm anchorages). At the start of the BPO this question might have had a simple answer. We just follow Jimmy Cornell to whatever destination he declares. But Jimmy is not here. And in fact three additional boats have just dropped out: Ransom, Libby and Coconut Woman. They all have good reasons, and I wish those crews all the best, but boy will they be missed! On the other hand, Tahawus is back in. And then there is Joyful — the boat that lost their crew back in Key West just before departure. They found crew, and set out to catch the fleet (if we can still be called that). 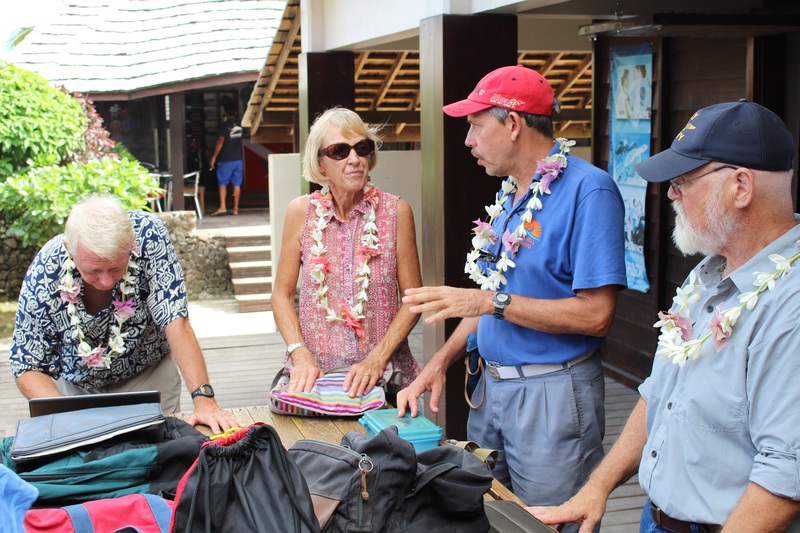 They went non-stop from Panama to the Marquesas– 40 days! And then direct to Bora Bora. They caught up, but the skipper is not feeling well, and seems to have some unidentified infection. They may also have to drop out of the BPO. So our “fleet” in this voyage-of-attrition is now Tahawus, Chapter Two, Maggie, Drina (a boat that went through the Northwest Passage and will be joining us in the coming weeks), a questionable Joyful, and ourselves! Getting individual attention from the BPO reps is wonderful, but you can’t help but wonder if we have a critical mass to hang together. In any case, there are many paths that can be followed between here and Australia. 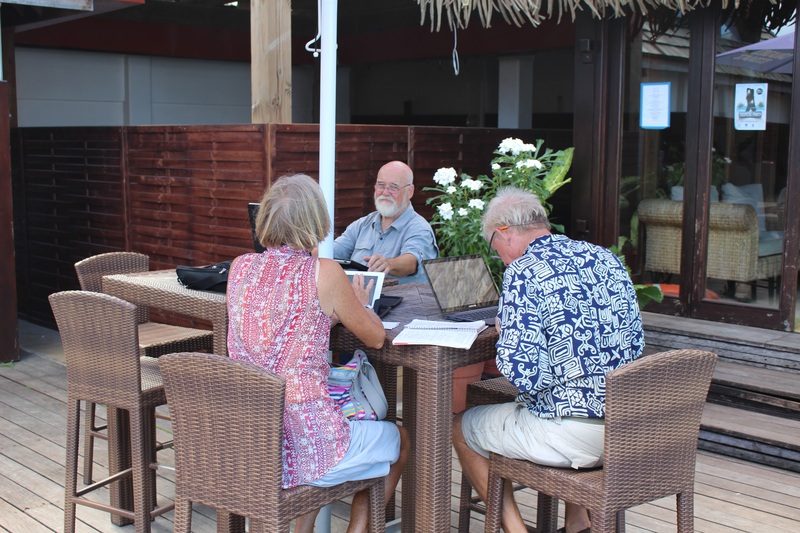 We all plan to rendezvous in Vanuatu. But that’s over two months away. I think most boats will rendezvous in Vava’u in two weeks. Whatever…we’ve got a plan, and hopefully we will cross paths with others. And if not then we’ll just have to make some new friends. Our plan is to stop in Maupiti (still French Polynesia) on our way out. Then skip the Cook Islands and go to Niue. Then Vava’u (Tonga). Then tentatively Tuvalu, but that’s too far ahead to really know at this point. Still figuring out what’s next after receiving our farewell leis. No one actually left on the scheduled departure date. BPO Part IV? This project seems to one of constant change…. Hope the skipper of Joyful is ok and this much smaller fleet holds together. Vanuatu is amazing. You must visit the volcano in Tanna! Hi from Lewiston Middle School, Zeke! Due to a busy year’s end, we are a bit behind in our correspondence. But wow–those pictures! The kids are awestruck by the beauty and intrigued by the colors of the water and how it differs from our Maine ocean water. On our most recent “Zeke Day,” all the kids scrolled your site on their iPads, reading and commenting and selecting favorite pix which they then collated and Airplayed for the class. Hailey wondered if you have considered making a calendar with your favorite pictures. Many loved the black pearl and wanted to know if you got to keep it. Zamzam asks what kind of tissue was implanted to make it black. Practical Chantel wants to know if gas for your boat costs a lot in Bora Bora. Ryan’s question is “Was your wife a huge help?” Reginald’s comment was, “What? Since when can doctors prescribe champagne?” Brooke is interested in knowing if, with what you know now, would you do this again? (I’m guessing yes!) We looked up and found that black sharks can be 60-100 lbs, and Ben would like to know how big you guess “yours” were. Alia would like to know if you have seen any endangered animals. Veda is concerned: “Do you ever have the fear of sinking/dying? She also wonders when do you have time to answer all these questions?! We only have two and a half weeks of school left. Although teachers will follow you through the summer, the kids likely won’t, so after one or two more “Zeke Days,” you may not hear from your partners until September! Where will you be then! I will be sure to move our little origami “No Regrets” along the hallway world map in the meantime. We would LOVE to Skype with you sometime June 15-18, if you happen to be somewhere where that could happen! Please let us know if that would be possible. What a way to end the school year that would be! Zeke just left Bora Bora where they had an internet connection. He arrived at Maupiti today, a Society Island of French Polynesia. I forwarded him your latest post with your questions. He may get internet again before you the school year ends but I’m not sure. If not, he will relay his response to your post to me through his email via his ham radio and I will post it on his blog for him. Thank you for all your support, interest and curiosity of Zeke’s voyage. Your questions allow him to appreciate his experience and to expand his awareness and perspectives. 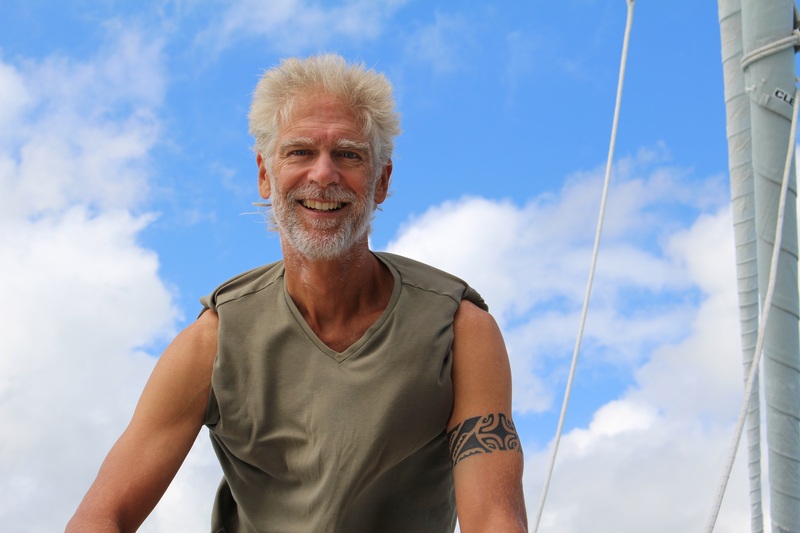 Your questions provide fresh and different ways of perceiving Zeke’s experiences, life on board, the natural world, and more. Thank you. Have a great summer!